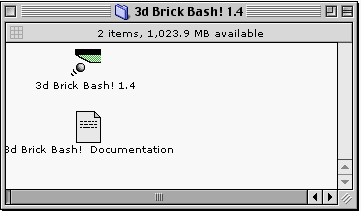 I’d long ago given up being able to run my old games 3D Brick Bash! and 3D Paddle Bash! on Intel Macs, but it turns out to be possible using a program that emulates Classic Macs on modern hardware. The one I tried was Sheepshaver but another option may be Basilisk. The instructions are a bit fiddly and there are legal issues to emulating old Macs so see the emulator home pages for details. One step I had trouble with was renaming the ROM file to something Sheepshaver would accept. 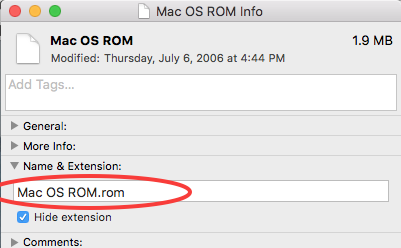 It turned out that although Finder was showing the correct name “Mac OS ROM”, there was a hidden “.rom” file extension that Finder wasn’t showing. To see if this is the case, select the file and choose File->Get Info. If the filename in that window has an extension, remove it. It was a real treat to play my old games again. And now that I have the emulator running I plan to hunt down other classic original Mac games. p.s. Speaking of original, classic Mac games: if you have fond memories of them please consider supporting Richard Moss’s book The Secret History of Mac Gaming, like I did! This entry was posted in Classic Mac and tagged Classic Mac, emulator, Sheepshaver on June 2, 2016 by Matt.